Kennebunkport, Maine is a quaint seaside town where President George H. W. Bush calls home part of the year on Walker’s Point. 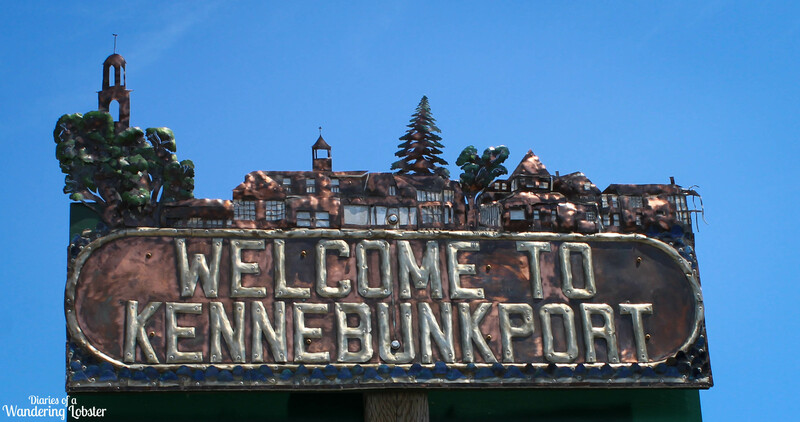 Thousands of tourists flock to Kennebunkport every year to get a glimpse of the former President and enjoy a little taste of Maine, or perhaps just a lobster roll! While the village area of Kennebunkport is a cute little area with lots to do, Kennebunkport also holds a little gem of a place just outside of its infamous Dock Square. Just little over 3 miles from Dock Square along Log Cabin Road is the Seashore Trolley Museum. The Seashore Trolley Museum was founded in 1939 by the Museum’s founding fathers when they banned together to save Trolley car No. 31 from the Biddeford & Saco Railroad Company. Over the years thousands of members and donors have saved and restored over 250 transit vehicles, most of which are trolleys, from all over the world and of different time periods. 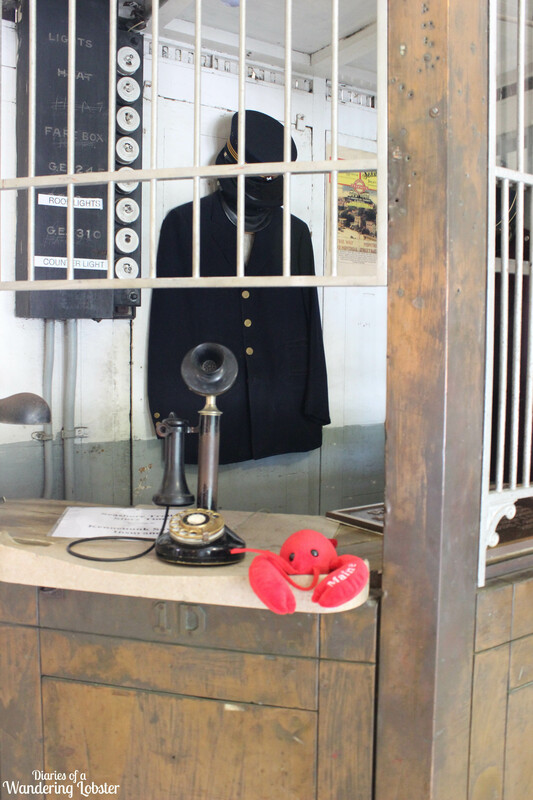 Upon entering the Museum, you are met with a small museum display of various artifacts and informational displays. There is even a small trolley for children to play on. As you walk through the Museum building that was built to resemble a real trolley station, you enter the brick courtyard where you will begin your journey through transportation history. I began my trolley ride through Talbot Park on the Connecticut Company 303, a bright yellow and red open-air trolley. 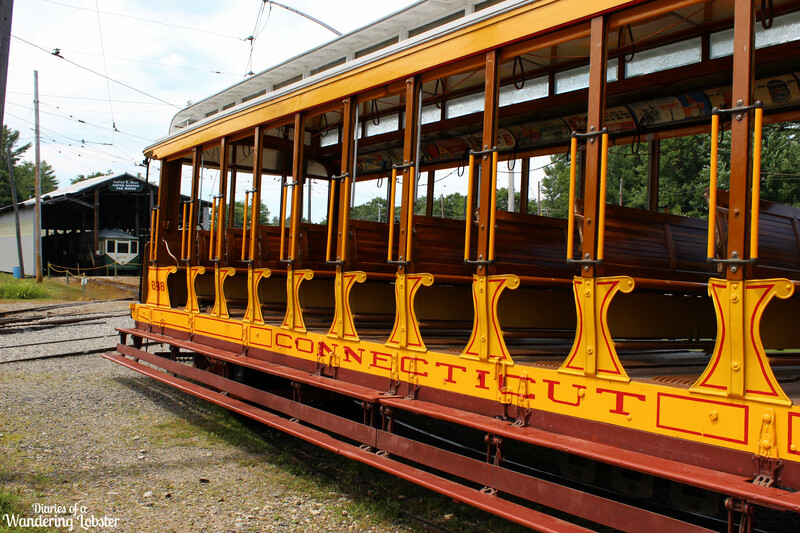 The trolley was built in 1901 and ran through 1948 when the New Haven streetcar service discontinued. The trolleys were often used to shuttle Yale football fans between the railroad station and the stadium. My second ride of the day was on the Boston Elevated Trolley No. 5821 built in 1924. 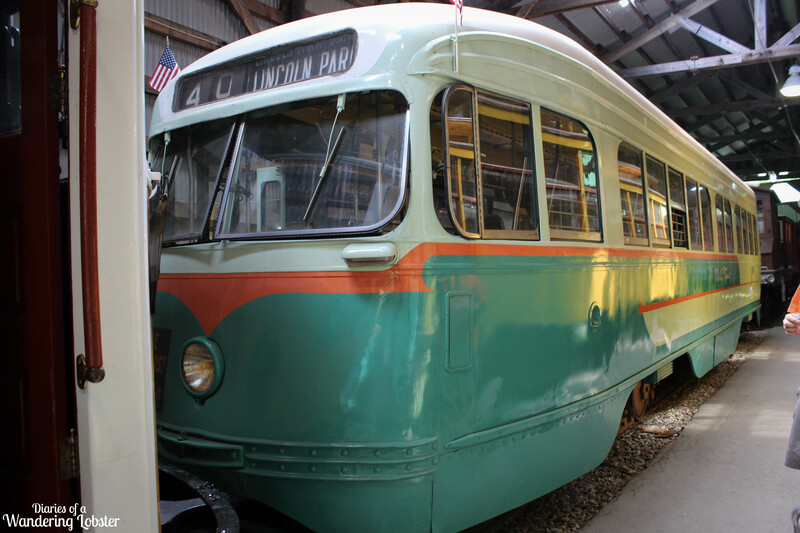 The trolley ran in and around the city of Boston and was acquired by the Museum in 1954. 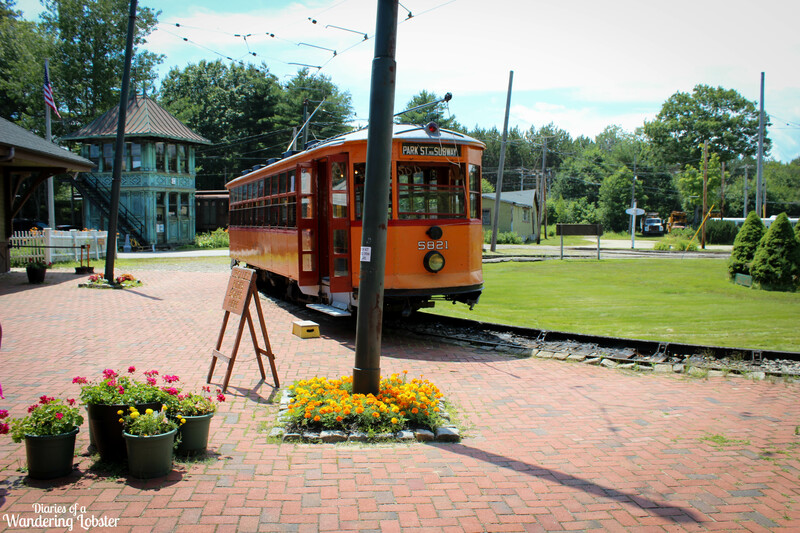 The Trolley Museum is located on a former trolley park called Talbot Park. The railroad lines run about 3 miles. 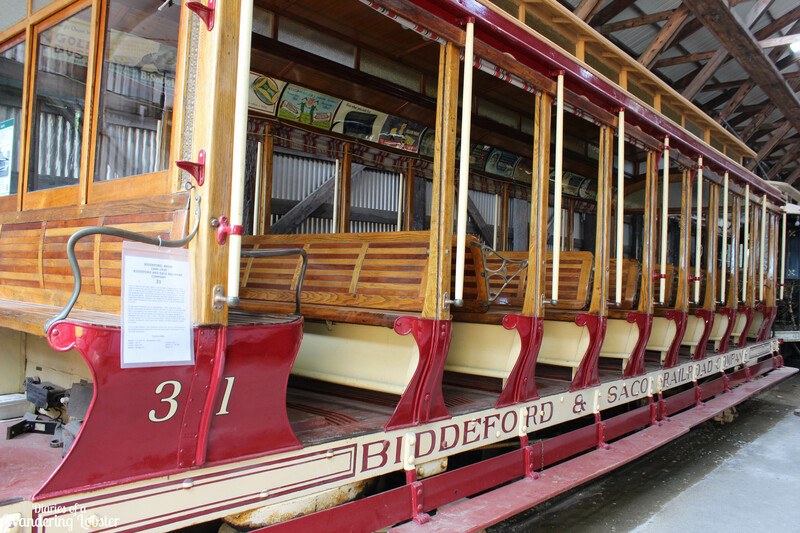 The Museum was started in 1939 by Ted Santarelli, John Amlan and Gerald Cunningham who rescued car #31 from the Biddeford & Saco Railroad for $150 and moved to its current location. Over the past-half century, hundreds of volunteers and several paid employees have restored trolleys for the enjoyment of museum visitors. It is actually one of the largest electric railway museums in the world! I was very fortunate to be able to receive a private tour of the Museum by Doug, a long-time member and trustee of the Museum. Doug was a walking encyclopedia of trolley history as well as very enthusiastic about the Museum. 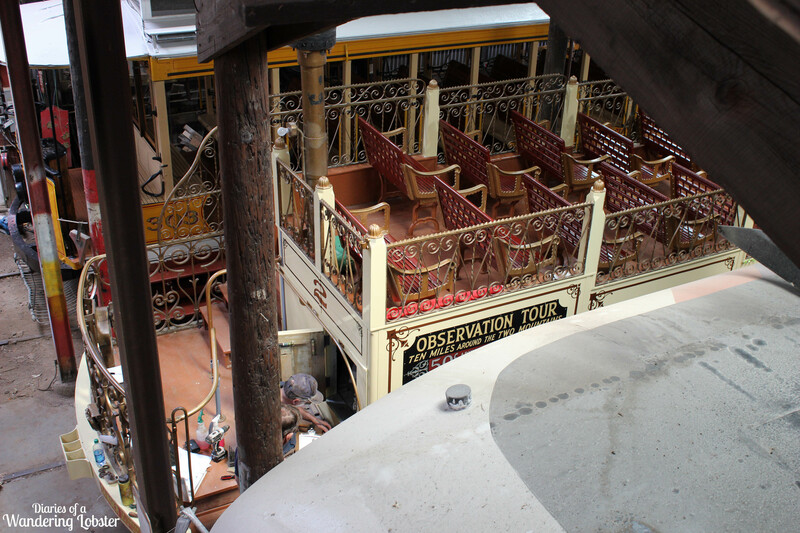 We started our tour in the restoration barn where several trolleys were being restored. One worker was putting on the finishing touches of a stunning open-air trolley was Montreal. Only 4 of these trolleys exist and the Museum is lucky to have such a beautiful and unique piece of history. Look for this car on the rails! Many of the volunteers that spend countless hours working on the trolleys are retired craftsmen and the work they do is incredible. For example, several trolleys have wicker seats. The volunteer who restored all those seats is a retired cabinet-maker and they are absolutely gorgeous! After a walk through the restoration barn, there was several “car-barns” filled with about 6-10 different trolleys. Each barn is a mix of domestic cars from the US and from international locations. Trolley cars come from as far away as Australia, Japan, London, and Italy. Many of the cars also come from the Boston and New England Area. One of the most popular trolley cars is the Parlor car from the City of Manchester, New Hampshire. The car was built in 1898 by Briggs Carriage Co. One really interesting fact Doug told me was that trolley lines can be privately owned. This car was privately owned by trolley line owner and could be rented for the day for $5. Now, back in the early 1990s millworkers only made about $1.25 a day so only the wealthier folks could afford a ride on the Parlor car. 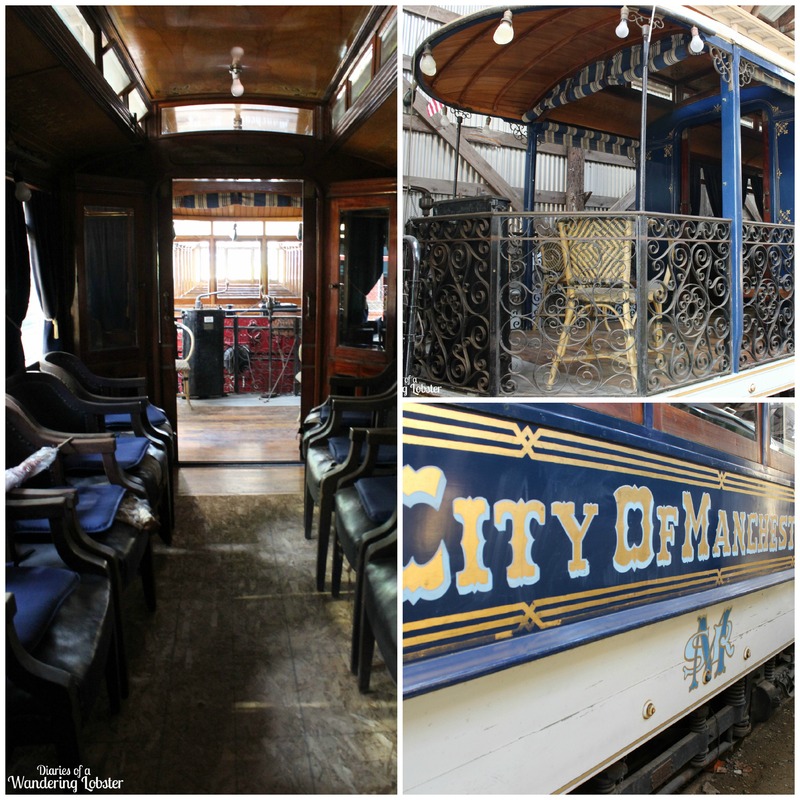 After the parlor car was discontinued, it was used as a children’s playhouse until it was acquired by the Museum in 1952. One of my favorite cars was one of the streetcars from Australia. 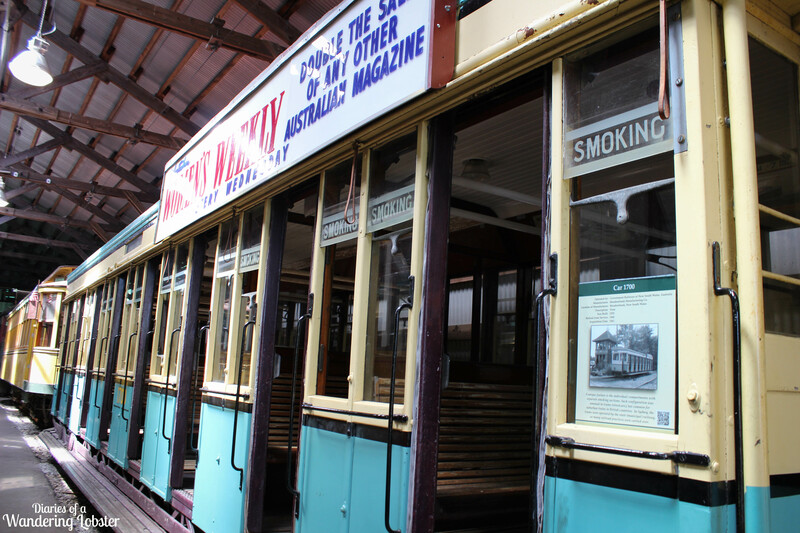 The car was built in 1925 and ran through 1960 on the Sydney Tramways. It was very colorful! Another favorite story of the day involved one of the founding fathers. He was a WWII veteran stationed in the Pacific theater, which is how the museum acquired the Sydney trolley. The man fell in love with it. But, in the 1950s he also obtained trolley cars from Nagasaki (Japan), Rome (Italy), and Berlin (Germany). If you know any WWII history, you know that Japan, Italy and Germany were our enemies in WWII. I thought it was cool that one of the founders wanted to adopt a trolley from each of our WWII enemies shortly after the war ended. Classy move, sir. The “people catcher” to catch people who walk in front of the trolley cars! At the end of the tour I was sad to leave. I would have loved to have ridden more cars if I could have! The Museum is full of amazing history and I was surprised to learn about the significance the trolley car had on not only New England and US history, but also internationally. The Museum is open 7 days a week from Memorial Day through Columbus Day from 10am to 5pm. Adult admission is $10, children 6 to 16 are $7.50, and children under 5 are free. The Museum is also dog friendly and holds a dog in the park day in June. Check the calendar of events for weekly events such as children’s story time and morning movie time for kids. On August 22nd the Museum has an exciting fundraising event called Seashore Trolley Speakeasy where you can dress up in 20s costumes and enjoy an evening of jazz, trolleys, and alcohol! Who wants to go?! 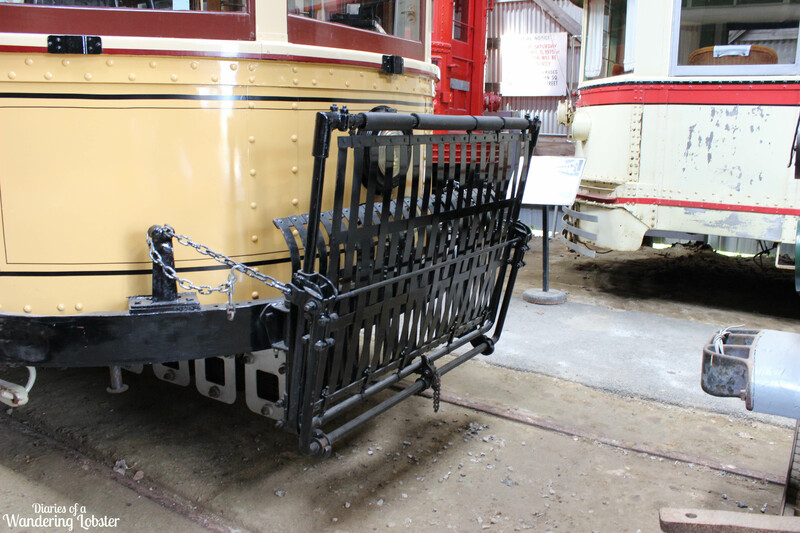 The first trolley rescued in 1939 that began the whole museum! 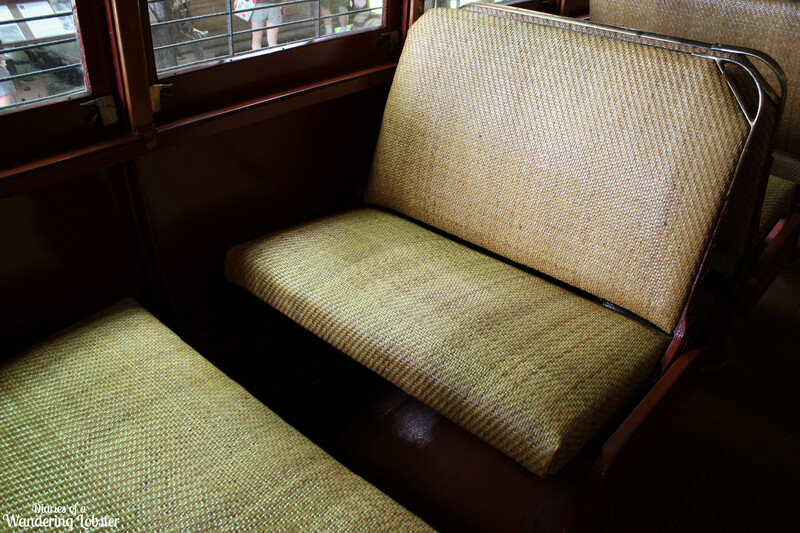 The restored wicker trolley seats handmade by volunteers! Even Walley, my wandering lobster partner-in-crime enjoyed the Seashore Trolley Museum! 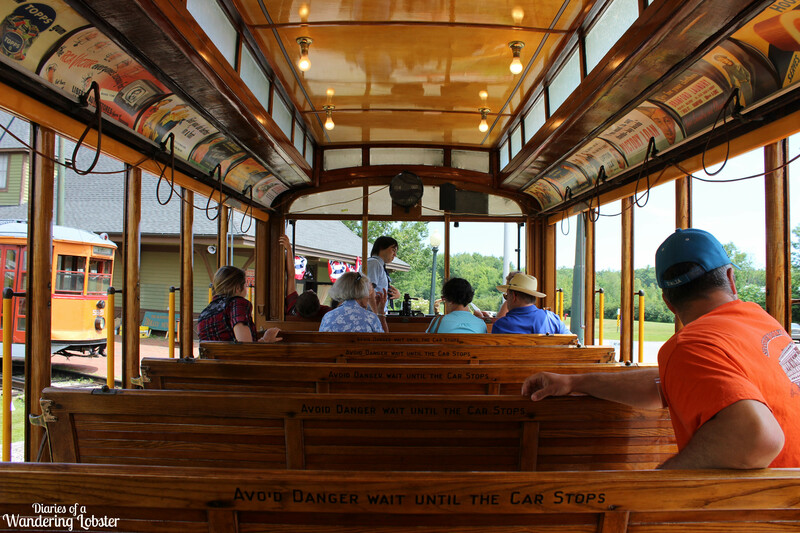 Would you check out the Seashore Trolley Museum? Have you ever ridden a trolley before?